Ever have a Christmas morning where you received one incredible present and everything else faded away as you reveled in that spectacular gift? I missed out on that -- we celebrated Hanukkah at my house. But I finally did have my Christmas morning last Thursday night at the Essex Bar when my friend Stephen handed me an enormous shopping bag. 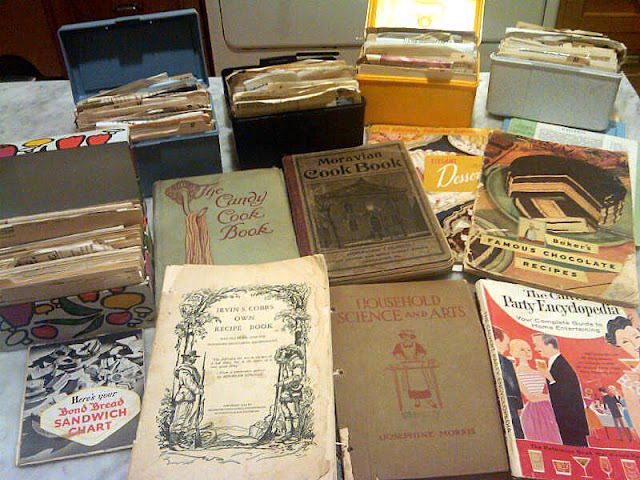 Inside were five recipe boxes filled with hand-written recipes (mostly desserts!) and all manner of vintage cook books and pamphlets. I couldn't believe my eyes. And, everything else faded away as I pulled out one fabulous card after another, and book after book of intriguing recipes. Even my blood orange cosmopolitan sat undisturbed at the bar. All of these treasures belonged to Stephen's beloved mother, Olive Facey, who died in May at the age of 97. I am honored to get to make her recipes (and hope some of them bring back some taste memories for Stephen!). 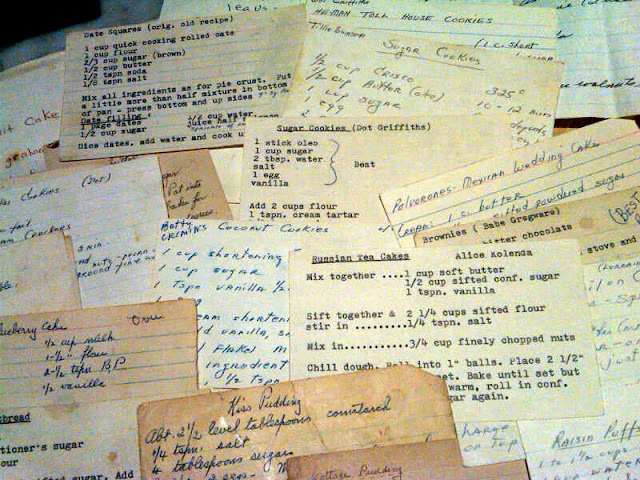 Olive's recipes span the arc of a life -- and more. In the boxes are cards that date from the 19th century, written in her mother's careful hand, and those that require the use of a microwave oven. Many recipes are attributed to friends, their names recorded at the top of the cards. 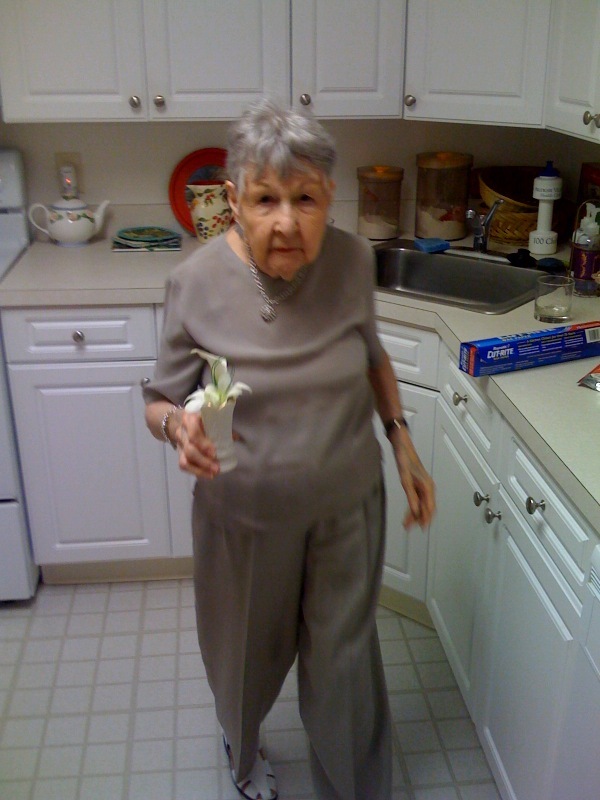 Below is a picture of Olive, corsage in hand, taken three years ago on the wedding day of Stephen and his partner Jay in Massachusetts. When the couple told her they were getting married, she hesitated for a few minutes -- only because she was trying to figure out what to wear to the wedding! I never had the pleasure of meeting Olive, but I'm sure I would have liked her a lot. And as I have the privilege of baking from her recipes in the coming months (and years -- she has a lot of recipes! ), I have a feeling I'll get to know her. They say when you cook from someone's recipe, they're right beside you in the kitchen. This is really lovely -- it is so wonderful Olive's recipes got handed off to someone who will really appreciate them and love trying them out -- and who shares. And your friend Stephen will get to have taste memories and he made you happy. The whole thing is great! I am eager to read about what you try out. have fun! Thanks, Pamela! I would love to leave my day job THIS VERY MINUTE to try some out! Please check back, as I will be reporting on these treasures in the coming weeks. Such a sweet story. Olive's recipes have found a loving home, I can imagine how touched you were to receive them. Happy baking! Mary Ellen, thanks for your comment. And you're right, I was (and still am) incredibly touched to have received Olive's recipes. I can't wait to see the brownie and he-man chocolate chip cookie recipes!! Such wonderful names! And Kiss Pudding?? Hurry hurry hurry - try them all then let us know! @LBDDiaries: I'm as impatient as you -- I've already tried three recipes, a lemon cake pie, and two shortbread recipes. Look for a post soon! My heart was tugged with this story. You will feel as if she is right there having coffee with you in your kitchen as you unfold her recipes. They are so much more than recipes, they are stories and memories, and they are gold. Bless your friend for his generous gift and for keeping his mother's recipes alive. What an amazing story! I am reminded of why cooking is such a lovely way to share life and create memories with people you love. Enjoy your new treasure trove of recipes! @irishgirlinpink: Thanks for your kind remarks. Your are so right, that they are more than recipes, and I appreciate my friend's generosity in gifting me with these wonderful recipes. @Jenopolis: Thanks so much. I've really been enjoying cooking through Olive's recipes and totally agree with their power to create memories. Glad you read this! Thanks, Sue. I'm slowly working my way through this treasure.